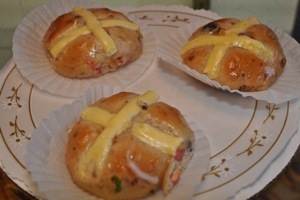 For a bakery known for its cakes, hot cross buns may seem an anomaly. But not to the devoted fans who come for miles around in the weeks leading up to Easter to get their yearly fix at Gerry’s Cakes. “I use the same recipe that Gerry and his father used,” said current owner Sohrab Molavi, who bought the bakery a year ago from Vicki Waters. For area newcomers, a little history: The Pink Pastry, owned by John Stagi, was a fixture on Santa Cruz Avenue for three decades, opening in 1957 and closing in 1986. Gerry Stagi worked at his father’s bakery and opened Gerry’s Cakes on Chestnut St. in 1993, selling to employees Waters and Sharon Garza in 2003. Over the years, rumors that the bakery was closing has rattled the nerves of devotees of its custom-made, special occasion cakes as well as long time favorites like coffee crunch and all chocolate cake. Sohrab happened on Gerry’s Cakes accidentally a couple of years ago when, by chance, he drove by. He stopped and applied for a baker’s position. A year later Waters called to tell him the business was for sale. In the last few months, he’s freshened up the appearance of the bakery’s interior with new paint and counter tops and put a new sign out front. He’s open seven days a week so that customers can pick up their orders the same day they’re serving their cake.